When Jobs unveiled plans for Apple’s spaceship campus, he reminisced that the land used to be full of fruit tree orchards (as you can see above). Now it’s a sprawling suburban area with dozens of other tech companies and housing developments surrounding a giant ring. 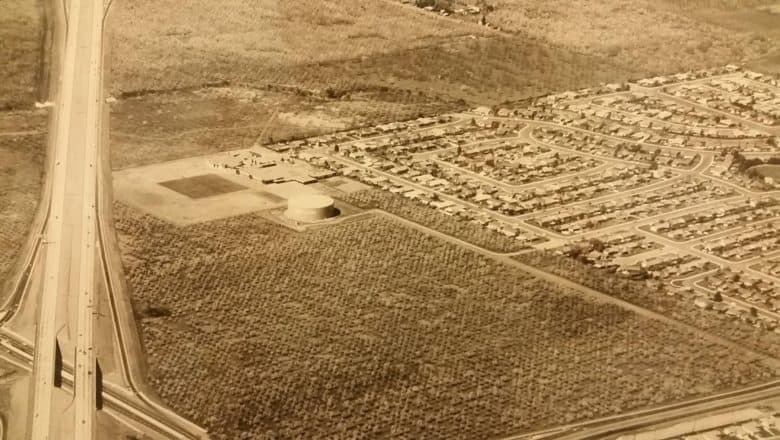 Chris Espinosa, one of Apple’s first employees, recently uncovered the photo of Cupertino in 1961. The picture on the left comes courtesy of the Hatfield Aerial Survey of Santa Clara and hangs in the Santa Clara Public Library. The picture on the right is the most current image from Apple Maps. Once landscaping is complete, Apple’s spaceship campus will feature hundreds of citrus trees. Apple is set to move into the building within the next couple of months. The new headquarters will run on 100 percent renewable energy. The campus will also house an auditorium where Apple will host public events.